We were fortunate this year that our warm, sunny weather extended well into October. We were able to get out into nature without too much preparation. But now the rains have started, bringing cooler weather and snow to the mountains. Our attentions will turn closer to home, as we explore trails at lower elevations. We try not to let the cold rain and gloomy skies keep us at home, but sometimes it can be challenging to gear up for these off-season hikes. Following are some tips I’ve used over the years. I hope you find some of these helpful as you brave the elements yourselves. 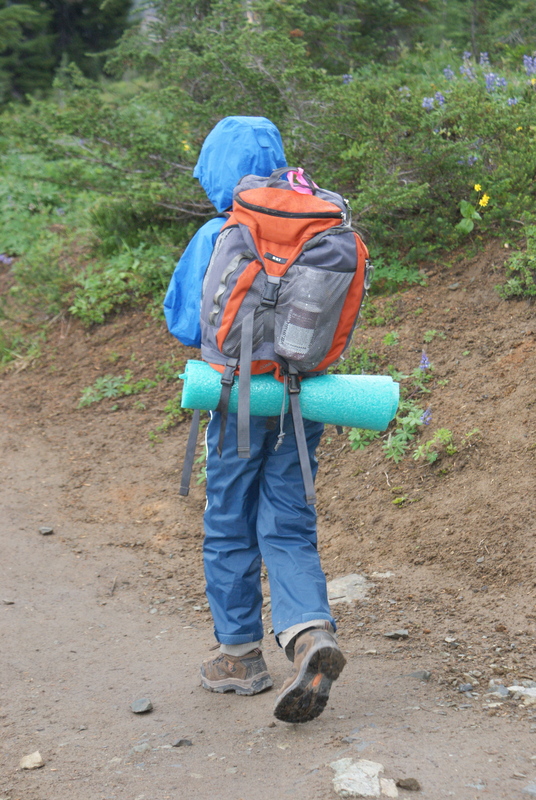 Keeping warm and dry is the biggest challenge for us on fall and winter hikes. I’ve used different approaches over the years. When I had little babies that I carried in a front carrier, I had a couple of fleece wraps that were made for car seats. They wrapped around the baby, and had parts that came down to enclose their feet and legs. My body warmth would help to keep the baby’s warmth regulated. 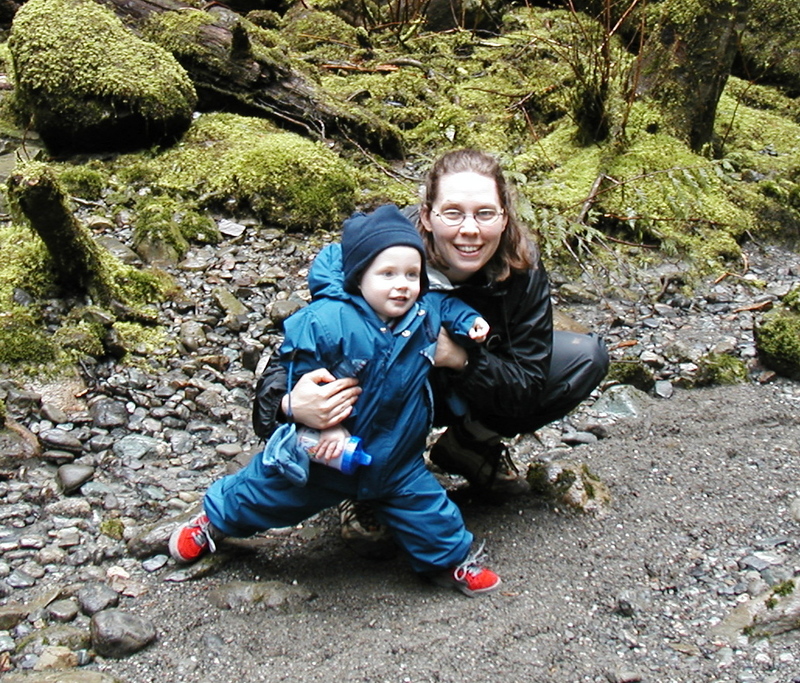 I didn’t hike much with babies in the rain; it just seemed like more than I wanted to tackle. When I carried my babies and toddlers in a backpack, I’d dress them in snow suits and snow boots. I found kids in a pack needed extra layers, because they weren’t exercising to keep their heat up, and weren’t against my body to stay warm. The snow suits usually had some water resistance, and would keep them toasty, even when they were wet. I’d layer these with fleece or polypro under layers. (Stay away from cotton, as it holds water, doesn’t insulate when wet, and takes forever to dry.) Wool or thick polypro socks would go in the boots. If we went on a walk where we would stop for a break and turn around, I could change out their socks and under layers if I needed to. Bringing extra mittens or gloves has helped me a lot, too. I used Glove Cats clips to keep the mittens and hats from getting dropped or pulled off. This made for a heavy, full pack for me, but helped keep spirits high for the little guys. As the kids got older, I was able to find more technical rain gear. 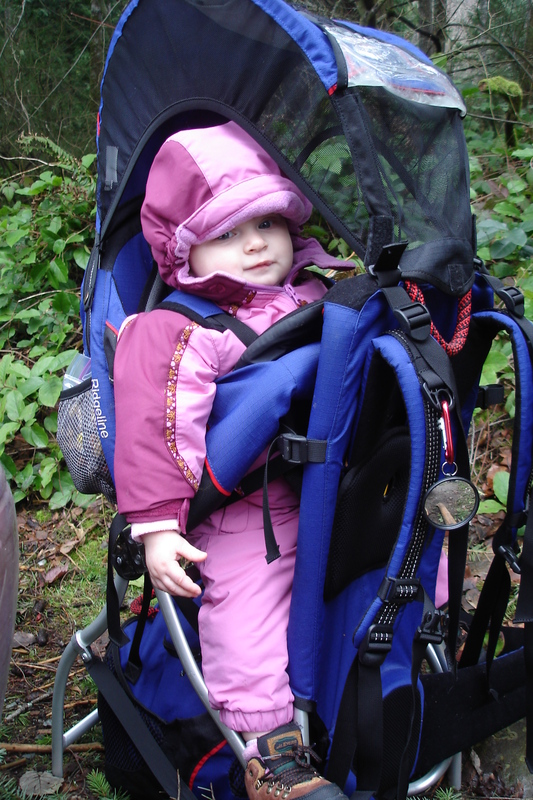 Usually I buy my kids’ gear from REI, though there are other companies that have them, too. I’ve even found good name-brand clothing at consignment and thrift stores. Now I usually layer waterproof rain pants with fleece or polypro long johns, sometimes adding their normal hiking pants in between. On top they can wear a long-sleeved polypro shirt, a fleece or wool sweater (thin or thick, depending on how cold it is), and a rain jacket. Having several lighter layers enables us to add or subtract warmth throughout our day. A warm hat is essential for each child, and helps everyone to regulate their body temperature. 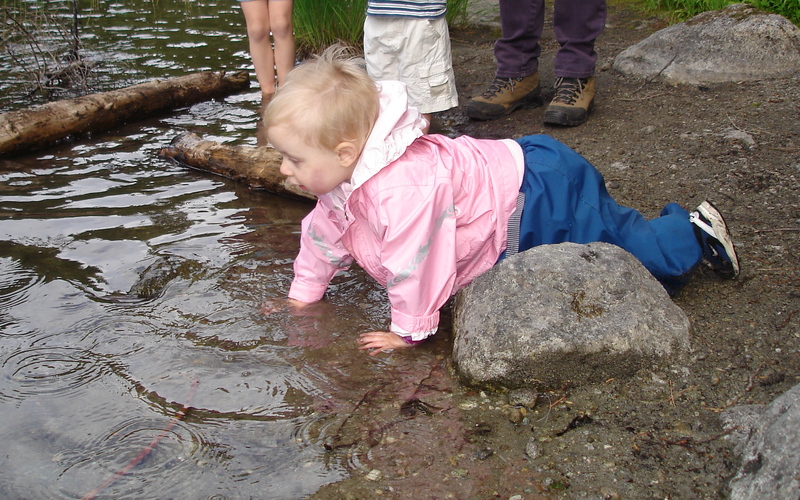 I’ve found that as my kids have gotten older, they haven’t needed the thick coats to hike in, as they create enough heat and don’t get chilled as easily as when they were babies and toddlers. We do need to be careful, though, not to overheat while walking, get sweaty, and then get chilled when we stop for a break. So we keep lighter layers on while walking, then don our warmer coats when we stop. 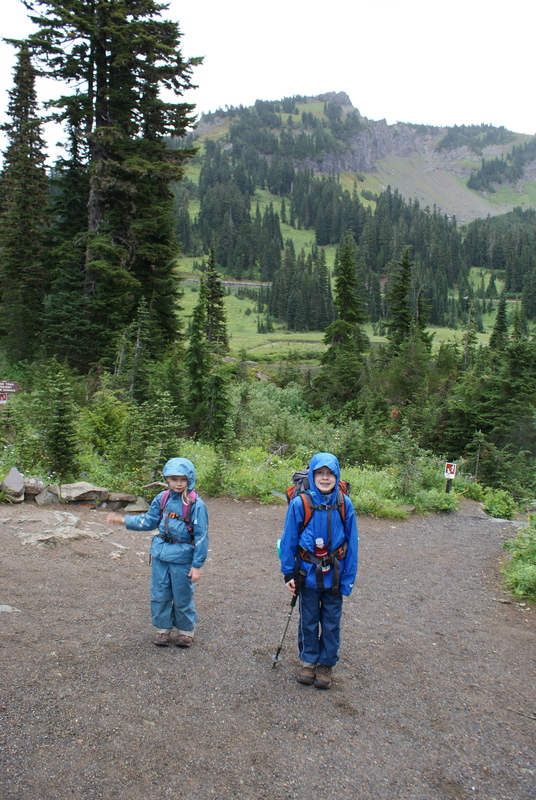 I dress kids in rain or snow gear even if it isn’t raining, because in our area, the ground is always sodden, except for a brief few months in summer. Even just putting some cheap rain pants over a toddler’s regular pants can go a long way to keeping her dry and warm. All bets are off when she crawls into the lake, though. Another trick we use in any season is to bring a closed-cell foam pad along to sit on. They are dense and light, and provide insulation and protection from the wet ground. We also like to bring a little stove, with a pot and some hot cocoa mix. A warm meal is also a wonderful mood-lifter in the middle of a cold day hike. 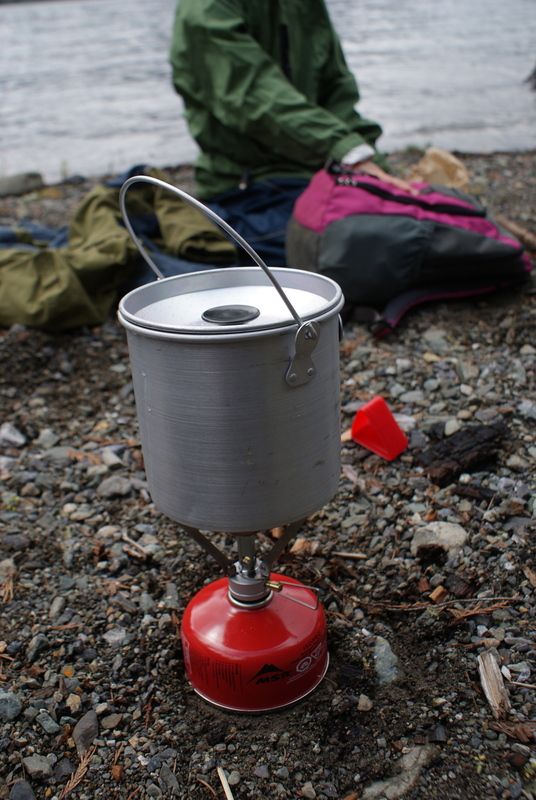 You can bring a dehydrated backpacking meal, or a packet of dried soup to warm your core. These little luxuries add bulk and weight to a parent’s pack, but provide comfort, and can make the difference in keeping children warm and hydrated. They can even be life-saving in emergency situations. As the fall gets closer to winter, it becomes even more important to make sure you know the weather forecast and road conditions where you are going. Have emergency gear and changes of warm clothing in your car, as well as extra water and food. Do your research to find safe trails appropriate for the season and weather. It’s Wet, But It’s Pretty! It can be difficult to force ourselves out of our cozy homes to hike in the wet and cold season, but we often find conditions aren’t that bad out there, as long as we’re prepared. We all need the exercise to combat the winter doldrums, and to keep our bodies and spirits healthy. For further reading: Renee Tougas at Outsideways wrote about their clothing strategy: You Are My Pouffie and I Love You. 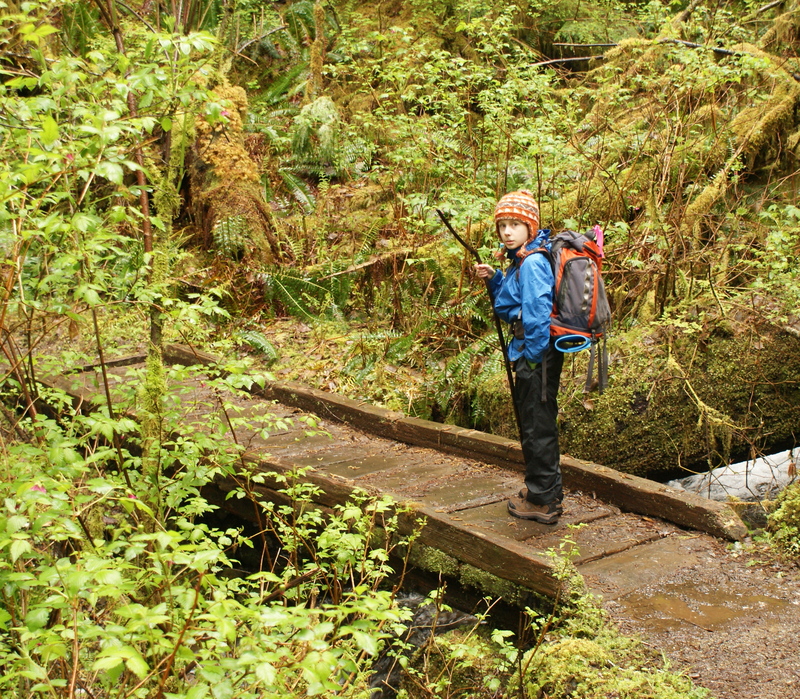 The Washington Trails Association wrote about how to stay safe during hunting season. 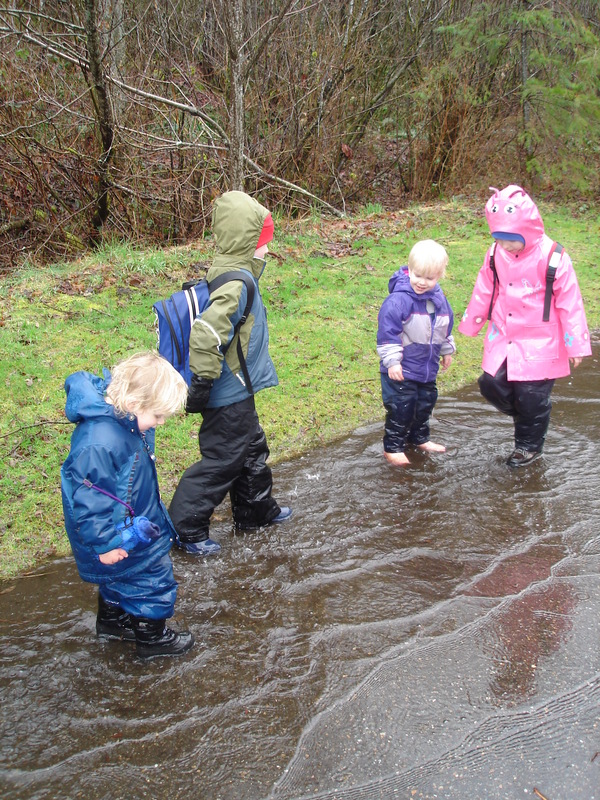 See my article on the ParentMap blog about rainy day hikes with an indoor component.